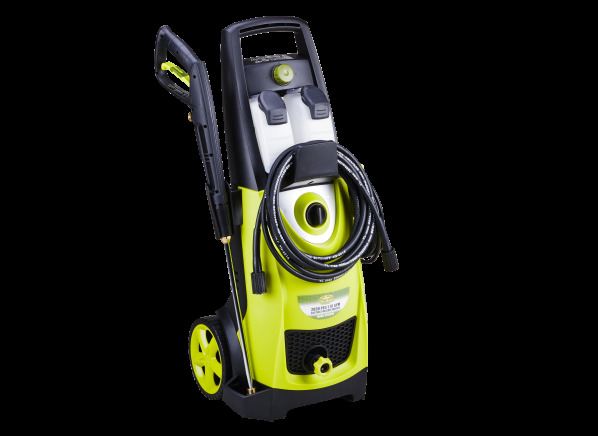 The Sun Joe SPX3000 is part of the Pressure washer test program at Consumer Reports. In our lab tests, Pressure washer models like the SPX3000 are rated on multiple criteria, such as those listed below. Power: A combination of pressure, measured in pounds per square inch (psi), and flow, measured in gallons per minute (gpm). Higher pressure results in better cleaning of a given surface; coupled with a higher flow as well, you'll get the job done the fastest. Noise: A combination of measurements, based on dBA, reflecting the proximity of the operator to the pressure washer. While our Noise score averages measurements taken close by the machine and at the end of the hose's typical reach, we strongly recommend hearing protection for working close by a gas-powered model in particular. Turbo Turbo Models with this feature, typically electric models, come with a special turbo or spin nozzle that allows for quicker cleaning with less pressure. Wheels Wheels Whether the unit has wheels. Most electric models are light and use solid-plastic wheels appropriate for that application. Gas-powered models typically have larger wheels that are solid or have pneumatic-rubber tires. Pneumatic tires can provide extra shock absorption, though they also lose air over time. Storage Storage Manufacturer recommendations on how to store the unit between uses and to protect it under freezing conditions. Many require the use of some form of antifreeze; manufacturers use different brand names such as Pump Saver and Pump Protector. Alternatively, the units can be stored indoors during the winter. Soap nozzle Soap nozzle A soap nozzle, sometimes called a detergent nozzle, allows the pressure washer to dispense soap or detergent under low pressure. Hose storage Hose storage Indicates whether the pressure washer has the preferred hose reel, a way to manually wrap the hose, or no ability to store the hose. Nozzle type Nozzle type Some units come with a single adjustable powerhead that provides infinitely variable spray angles from its minimum to its maximum. Others have replaceable nozzles that provide exact spray angles, typically from 0 degrees for a strong pinpoint stream to 40 degrees for a wide pattern, for quick, general cleaning. Number of nozzles Number of nozzles Total number of nozzles included with the unit. Soap/detergent dispenser Soap/detergent dispenser Most pressure washers can apply soap or detergent under low pressure. The easiest method is through an on-board tank where the soap or detergent can be stored. Another method includes the use of a bottle that is filled with the soap or detergent and attached to the end of the wand, making it heavier. The most basic method just includes a hose; for these, you need to figure out how to secure the bottle. Trigger safety lock-out Trigger safety lock-out All pressure washer wands have a way to prevent accidental engagement of the trigger. Some models require a manual process; others are done automatically. The latter can add an extra level of safety but can be less convenient to use. Weight (lb.) Weight Weight of the pressure washer, with all accessories, to the nearest ½ pound. For gas models, the weight includes a full tank of fuel. Pressure range (psi) Pressure range The maximum claimed water pressure at the nozzle, in pounds per square inch. Higher pressures can typically provide more cleaning power at wider nozzle angles, letting you complete the job more quickly. Flow rate (gpm) Flow rate The claimed amount of water being used, in gallons per minute (gpm). For reference, a garden hose without a nozzle can flow anywhere from 6 to 10 (or more) gallons a minute depending on the hose diameter and water pressure. Engine size Engine size For pressure washers with gasoline-powered engines, it's the engine displacement measured in cubic centimeters (cc). Most manufacturers no longer give a horsepower rating, so engine displacement is now the only universal way to compare relative engine size. Electric motors, however, are represented by amps. Cord length (ft) Cord length For electric models, the length of the cord, in feet. All models provide similar cord lengths, long enough to reduce the need for extension cords. Hose (ft) Hose The length of the high-pressure hose, in feet. Longer lengths allow further reach without the need to move the main unit. Temperature range (F) Temperature range The maximum recommended temperature of the incoming water. Some models allow warmer incoming water, though they that water isn't hot enough for steam-cleaning. Warranty (mos.) Warranty How long the pressure washer is covered by its manufacturer for defects or repairs. Pump protection Pump protection For gas models, leaving the unit running without spraying water can overheat and damage the pump. Models with a thermal-pump protection, however, can reduce the risk. For electric models, extended use or the use of an improper extension cord can cause the motor to overheat. Models that claim to have thermal motor protection will shut the motor in those circumstances to prevent damage.